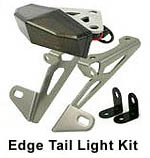 Click video above for a short overview of the DRC Edge Tail Light kit installed on SRmoto.com's WR250X (and WR250R). Also mentioned in the video is the 12oclock Labs DRC Edge2 Processor Upgrade Board installed in the tail light of our WR250R. The upgrade board is a drop-in replacement for the OEM DRC LED board inside the Edge Tail Light, and not only makes the tail light brighter, but also gives you a few additional features like safety brake light pulsing and even integrated turn signals. We also mention the flashers/turn signals we have installed on each bike, DRC Type 601's and DRC Type 602's.